A new trend of connected cars is motion. A connected car is a vehicle able to optimize its own operation and maintenance as well as convenience comfort, and entertainment of the passengers, using onboard sensors and internet connectivity. Moreover it can connect with other devices in and out of vehicles at home, office, infrastructure and even other cars as well. Automotive OEMs across different regions are currently in phase of developing, presenting, producing and marketing new connected car features. By inculcating internet into the automotive world, new horizons can be achieved. Vehicle Health Monitoring is one of the features of connected car that it would diagnose the vehicles performance and send the data to the manufacturer. This would let the design engineers to get real time data, which could be used for designing future models. More applications of connected car include Vehicle to Vehicle and Vehicle to Infrastructure communication, road weather management, and many others. Within a year or two public transport uses bloomed to heights due to applications like olacab, ubercabs, etc. The use of connected cars for public transport supported with these applications would give the connected cars market a new face. Some more end user industries of connected car are govt. transport department, telecom industries etc. Connected cars have features like navigation, Automotive System Diagnosis and Prognosis, Gesture Control and Voice Commands, Contextual Help, Parking Assistance, Safety and Security, Fleet Management, Vehicle Tracking, Road Side Assistance, Wifi hotspots and many others. 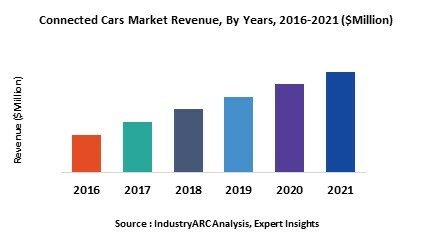 The connected cars market is segmented on the basis of connectivity, interaction, features, applications, geographical regions. Under interaction it is further categorized into Vehicle to Vehicle, Vehicle to Infrastructure, Vehicle to Device Interaction and few more. Vehicle can interact with each other and with the infrastructure to get traffic updates, avoid accidents and save fuel as well. This would again be a driving force for this market. Major players manufacturing connected cars are profiled in the report with company overview, financial overview, business strategies, product portfolios, recent developments and market shares of the key players. The report contains detailed and in-depth analysis of the segmentation of the Connected Cars market.